Eek! 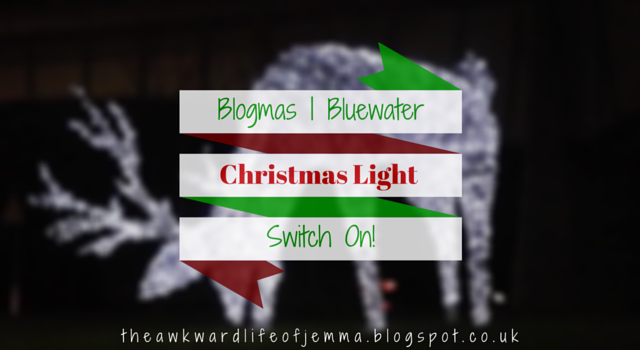 I am so excited to be writing my first Christmas themed post this year! Yes I know it's technically not December until tomorrow but I've waited long enough to share this vlog with you and otherwise I'd have to wait until Friday's post which is just too far away. You can't say I didn't warn you as I've already done my monthly roundup for November too! The festive season is well and truly upon us and all major shopping malls and town centres turned on their Christmas lights a good few weeks ago now. Our trip to Bluewater was very spontaneous as I only received an email from Bluewater (part of their newsletter subscription emails) the day before and casually suggested that we went without ever thinking we actually would. As it happened though Harry got him from work without any traffic, we looked up the route on Google Maps and it seemed completely clear estimating we'd arrived at 6.30pm when the lights and fireworks were due to happen at 7pm so we decided we'd drive down and hope for the best. It didn't take us too long (about 45 minutes) and there were no queues into Bluewater so I assumed it wasn't very busy (haha!). Once we'd parked and headed over to the event area we realised just how many people had turned up! Luckily the display was amazing and it wasn't too chilly (despite what Harry may say in our vlog!) unlike the weather over the last week or so which has been freezing! It took us a good 20 minutes or so to actually make it back into the shopping centre afterwards because the crowd was pretty almost at a standstill but eventually we got to GBK (what else would you expect from me?!). I ordered the Christmas bundle which for £15.00 includes the Bah Humburger (oh my, it was so so good I could've dreamt about that burger!) with a regular portion of fries and the Christmas milkshake which is flavoured with Lotus biscuits. In my opinion this is really good value as the milkshake is normally around a fiver alone! We did browse Bluewater after we'd stuffed our faces but we didn't buy so we soon headed out to get a proper view of the lights. Each of the roundabouts around the shopping centre has it's own gigantic reindeer made out of hundreds of white lights and they look absolutely stunning! I've not been to Bluewater at Christmas before (we usually go to Lakeside) so I don't know if they always have them but I've never seen such beautiful Christmas lights, I wish we had something like it near us! Anyway, I've babbled on long enough when you can just watch our vlog to see everything. I'm hoping to do a bit more vlogging over the Christmas period but you can expect all of my posts to be Christmas themed from now on!